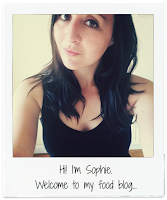 So I missed free-from week, which I am majorly upset about as I had a great idea, but I was too hungover from a hen party to even contemplate baking, and then the week kind of slipped away. I’m sorry guys! I will still make the cake, at some point, but won’t include it as part of my bake off bake along challenge. This weekend, however, was alcohol-free and boy free! I had the house to myself, and after a lovely evening with my friend watching Harry Potter and eating chocolate frogs (Freddos), jelly beans and macaroni cheese, I had the whole Sunday to bake. A rare treat. I chose the frangipane challenge, mainly because cheese and sultana pastry sounds absolutely vile, and I am not making puff pastry, who even has time for that? Life is way too short! 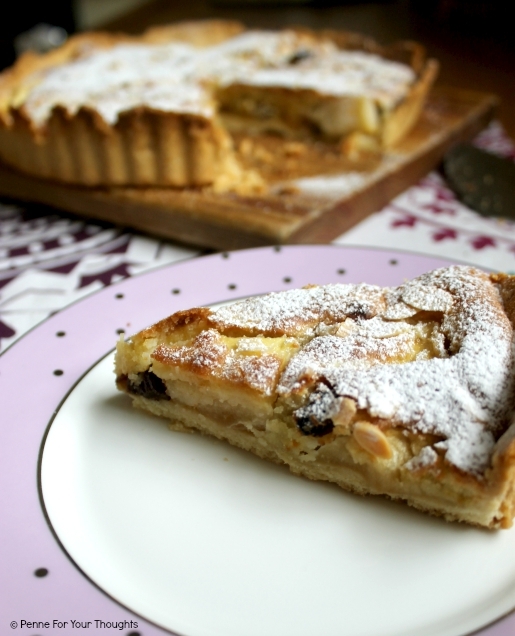 I wasn’t sure I liked frangipane, mainly because I am not a massive almond/marzipan lover, however this just had a subtle taste and as it was packed with apples and sultanas it was really good. I ate like 3 slices in one day, wooops. I adapted a few recipes to come up with this, but I did use a Mary Berry (standard) for the shortcrust pastry, which I blind baked to avoid soggy bottom. Roll out the pastry on a floured surface until about 2mm thick, line the tart tin with the pastry, patchworking any bits that need it with scraps of pastry, a slight overhang is good. Line with greaseproof paper and baking beans and place on the hot baking tray and bake for 10 minutes. Remove the baking beans and paper and bake for a further 10 minutes. Meanwhile make the filling. To make the filling use the food processor to mix together the butter and sugar, once smooth add the ground almonds and mix again. Trim the edges of the pastry if still overhanging to neaten it up. 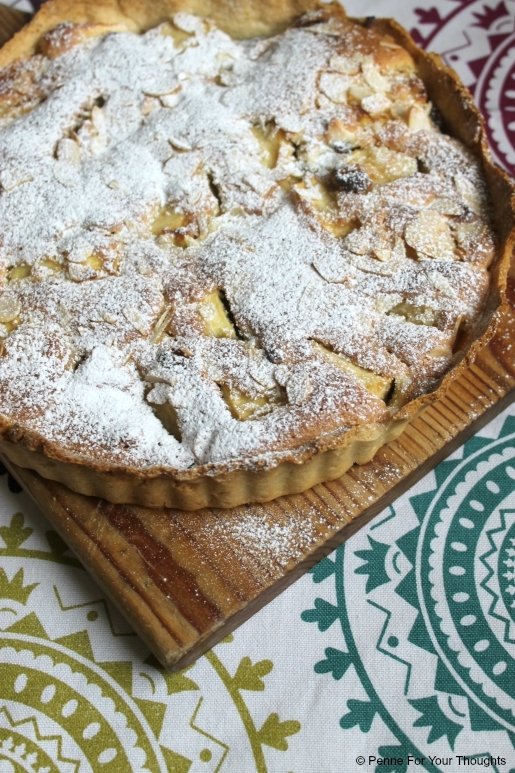 Then fill the pastry case with the apples and sultanas and top with the almond mixture, top with a handful of flaked almonds. Bake for 30-40 minutes until filling is golden and springy to touch. Leave to cool in the tin for 10 minutes, then remove from tin a leave to cool completely before dusting with icing sugar and serving. The tart will keep in the fridge, covered in clingfilm, for 2 days. 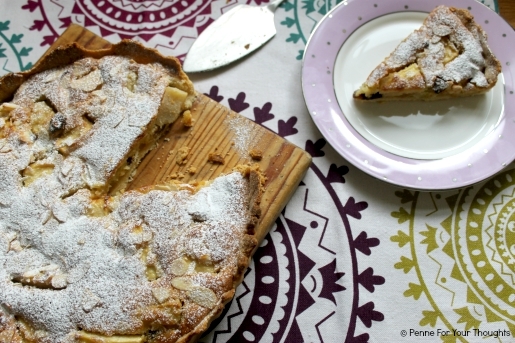 I wish my frangipane rose like yours - it's gorgeous dusted with sugar! Ha ha, three slices, at least it wasn't in one sitting :-) The frangipane tart looks scrummy! This looks stunning! Great flavour combo to choose!